Greenboro, Ottawa - We invite everyone to visit our open house at 234 Duntroon Circle on May 8 from 2:00 PM to 4:00 PM. Ridgemont, Ottawa - We invite everyone to visit our open house at 1722 Edgehill Place on May 8 from 2:00 PM to 4:00 PM. Greenboro, Ottawa - OPEN HOUSE, SUN. MAY 8, 2-4PM Gorgeous & extremely rare 4-bedroom end-unit townhome with handy main-floor den. Includes 5 brand-new (never been used) appliances with transferrable 5 yr extended warranty, fully-finished lower-level family room with cozy gas fireplace for those chilly evenings. A large, fully-fenced, landscaped yard and patio are great for summer entertaining. Larger home, 2065 sq feet (according to builder). Oak hardwood floors in living and dining rooms, spacious 2nd floor laundry. Freshly painted. Seller is original owner and put $50K in updates including interlock front and back! Need a nice 4 br end townhome? Don't miss out on this one! Hope you are having a great spring! My son Eric and I are excited to help you with any real estate questions you may have! Here are the latest stats from the Ottawa Real Estate Board for the month of May… Sales volume up from last year, prices for freeholds up 2.6 percent and condo prices down almost 5%... Good buying opps in condos right now. If you or anyone you know is thinking of buying or selling real estate, have any questions, need trades people recommendations, or advice on work you are about to do on your house, Eric and I would love to put our over 30 years of combined experience to work for you! Can spring be around the corner...imagine -1 on Sunday...great for the open house for anyone needing three bedrooms and 3 baths in this Briston complex of mostly 2 br, 2 baths! Drop by to see why this unit is the best value for your money in the complex! Emerald Woods, Ottawa - We invite everyone to visit our open house at 3746 Albion Road on February 8 from 2:00 PM to 4:00 PM. 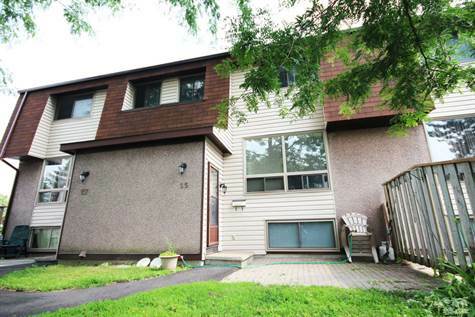 South Keys / Greenboro, Ottawa - Now available: 55-3240 Southgate Road, a 2 bath, 3 bdrm 2 storey. $239,900 - Very Affordable. Updated and inexpensive home near all amenities. When choosing a condo, space is often an important consideration. Do you need more living space? Do you know someone having trouble finding an affordable 3 br condo? If most of the other condos in the Briston and Blohm complexes have only 2 br and 1.5 baths, then a 3 br, 2.5 baths is certainly an advantage! 180 BRISTON PRIVATE, Hunt Club Park, Ottawa - We invite everyone to visit our open house at 180 BRISTON PR. on August 31 from 2:00 PM to 4:00 PM. 2640 DRAPER UNIT 25 now sold FIRM!!! If open concept is what you like, then 246 Gladeview Pr., Ottawa is the gold medal of home olympics! Ever since Eric and I started selling these Gladeview Towns in the Woodlands complex in Greenboro, Ottawa in the early 2000's, we have always been struck at how ''avant-gard'' and prescient this Richcraft design was for the times. True, the boxy interior layout of homes had been changing for a while back then, but the design of an open living room, dining room kitchen, foyer (basically the main living area) completely open WITH 12 foot ceilings...wow! That was truly innovative! The result is a feeling of spaciousness few buyers ever encounter in the south end of Ottawa. A diamond in the rough! Don't miss this! • 2 bath, 2 bdrm 2 story - MLS® $159,900 - Very affordable 2 BR! Redwood Park, Ottawa - VERY AFFORDABLE! Exceptionally good value since a little bit of tlc will make this place outstanding! 2 bedroom condo in a great area, steps from shopping, public transit and access to the 417, this cute property has everything for a downsizer or someone starting out! SO AFFORDABLE, why rent when you can OWN?